A good few years ago now, I wrote the first Click article to focus on USB Flash Drives and in it I rather optimistically sounded the death knell of the floppy disc which at the time was still very popular.Of course, I also thought the end was in sight when we were introduced to the rewritable CD, the Zip Drive and the 120Mb Floppy, but let’s not dwell on these points too much.The important thing to remember is that this time my prediction was accurate and this is down, in no small part ,to the remarkable success of the USB Flash Drive. Despite the widespread use of Flash Drives, I often still find myself giving a crash course as many computer users as still unaware to what these devices are and their potential benefits. 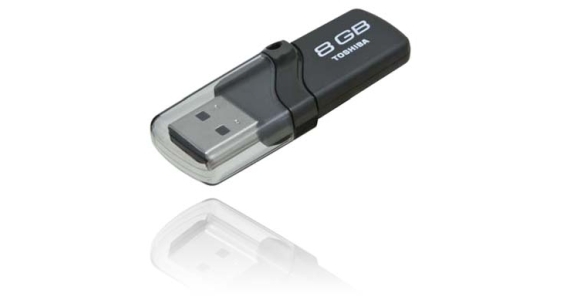 A Flash Drive, or Pen Drive as they’re often called, essentially consists of a memory chip encased in a small piece of plastic with a USB connector on the front so that it can be plugged in to pretty much any computer manufactured in the last decade.All Windows Operating Systems afterMillennium Edition have the necessary drivers installed as part of the Operating System so you simply plug the device in to a spare USB port and immediately you will be able to view all the stored files using Windows Explorer. There are many reasons why Flash Drives have become so popular of late and these include, but are not limited to, their speed of operation, small size, relatively low cost, high reliability and the amount of data that they can store. Whereas the humble floppy disc can store a maximum of 1.44Mb the latest USB Flash drives on the market will store 16GB of data which works out as the equivalent of 11500 floppy discs being stored on a device that weighs less than one single floppy.Additionally they are a great deal faster and more reliable than their floppy counterparts and entry level capacities of around a gigabyte will give you a couple of quid change from a tenner. Another reason for their success may be because they don’t need any hardware other than a spare USB port, system manufacturers were given the perfect excuse to avoid having to install floppy drives in to every machine they produced without limiting the potential for external storage.I’ve had customers come in to our store, purchase a pack of floppy discs and then return just half an hour later having found that their machine doesn’t include a floppy drive – invariably they then purchase a USB Flash Drive. Windows Vista now also presents a new incentive to those who were thinking about buying a USB Flash Drive.To explain the benefits we first have to look at a system known as Virtual Memory which is a technique used by Windows in order to increase the amount of system memory available to applications.Ever since Windows 3.0 which was released back in 1990, the hard drive has been used in order to store any temporary files which exceed the storage capacity of the system memory.This means that the amount of memory available for the computer to use during operation is practically unlimited.Unfortunately the hard disk is still a relatively slow device because, unlike most other components that make up a computer, it still relies on moving parts.A Flash Drive doesn’t have such a constraint so if you plug one in to your machine whilst running Vista it will volunteer to use any of the free space available as Virtual Memory whilst still allowing you to use the device in the intended fashion of a removable storage medium.Thiswill allow you to squeeze a little extra performance out of your machine without having to invest in any additional hardware.